It's all right, the spider is far smaller than this image. Lynne Kelly suffered horribly from arachnophobia so she set out to cure her terror by familiarising herself with its cause. From watching small spiders at safe distances, she worked up to letting a tarantula walk on her hand. This book details her healing – and learning – process. She is now a confirmed arachnophile and her book is full of affectionate observations of the spiders in her Melbourne garden, with their bizarre hunting and mating habits, complemented by a generous amount of scientific detail. 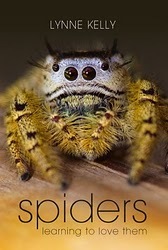 It is probably more than you ever wanted to know about spiders, but she is a science writer so it is all accurate, clearly written and well illustrated. Kelly’s latest project is The Spiderblogger. I did call her a ‘confirmed arachnophile’, didn’t I? Pingback: Tiny spiders in Queensland, Australia - photos and descriptions.